Don’t Let the Dead Bugs Bite! We couldn’t do any better than the actual title here. “Did you enjoy stepping on bugs as a child? Have you ever lit one on fire with a magnifying glass? What if all those bugs could come back from the dead? 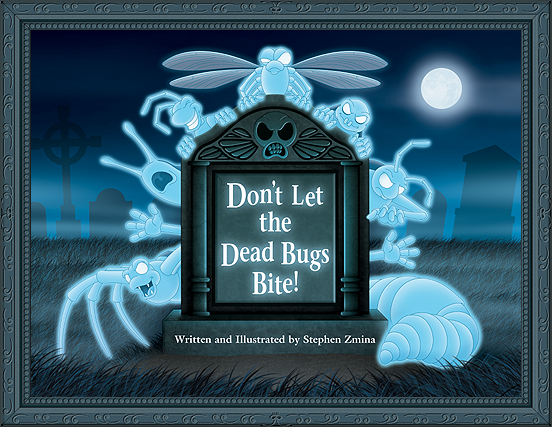 Don’t Let the Dead Bugs Bite! is the tale of a community struggling to rid itself of troublesome bugs that have come back to haunt their once peaceful town. This exciting story will capture children’s imaginations and may make them think twice before stepping on that next bug.” This new full-color book was written and illustrated by Stephen Zmina. As you can see from the official web site, there’s quite a roster of well-known celebrities who’ve read and endorsed the book! Make sure and check out the horror-movie-style trailer too.